There are so many ways that you can help us, even now that we're in Romania, and we would love to talk to you if you're interested and willing to help us in any of the following ways. Advocates - The BEST way you can help support us in a "creative" fashion is to be an advocate for the needs of the Romanian people. What would being an advocate look like? It means talking to others in your own circle about the Romanian people and Christ's ministry in that country. We love doing Skype/FaceTime/Facebook Live sessions with different groups of people to talk more about Romania. We've loved getting the chance to do "Ministry Spotlights" at churches through the internet, as well. Or perhaps you could forward our newsletters/blog posts/twitter updates/facebook status updates to your own contacts so that more and more people can be made aware of the needs in Romania. Having people to help us advocate for Romania would be such an encouragement to us! Proofreaders - Do you have a gift for writing and would be willing to proofread our newsletters and posts? We would love to have your help! Letter "Senders" - Now that we're on the field, it's very difficult and costly for us to send our paper newsletters at Christmas and Easter through the mail from Romania. It would be fantastic if someone - or a few people - would be willing to help us out with printing, stuffing, and labeling these letters. Sending Us Packages and Encouragement through USPS - Many people have asked us already how to send things to us here in Romania and what we need. First of all, we cannot say thank you enough for this wonderful, thoughtful kindness!! It makes us feel so special that you would even consider sending us anything, and we are so grateful. So we've compiled a list below of things that we enjoy receiving because we can't find these things here. But these are strictly "wants," and they are mostly food items. We can get everything we really need here. It is best if you are able to wrap the contents of your package in wrapping paper as a present so that it is less tempting and a little more difficult for it to be taken without us noticing. We also always LOVE getting cards in the mail!! * Gluten free foods (especially cereals): Honeynut Cheerios, Chex, Rice Krispies, etc. * Things for kids: coloring books, learning activity workbooks for 2 - 4 year olds, stickers, etc. ​* Special mixes: Sweet potato pancakes, beignets, malt-o-meal, etc. * Catalina has a lot of skin sensitivity issues, and Elin is developing eczema, as well. But Romanians really love their scented things! So her preferred fragrance-free products are always welcomed: Aveeno fragrance free lotion, Neosporin eczema lotion, Olay fragrance free face wash, Aveeno fragrance free shave gel, Dr. Bronner's fragrance free soap, etc. Sending Us Packages and Encouragement through Amazon.de - Another option for sending us things is to use Amazon.de which is the German version of Amazon. The pros here is that it's usually cheaper to ship, the packages come directly to our door instead of having to go through customs and risk being inspected and torn apart, and all the necessary import taxes are included in the prices! 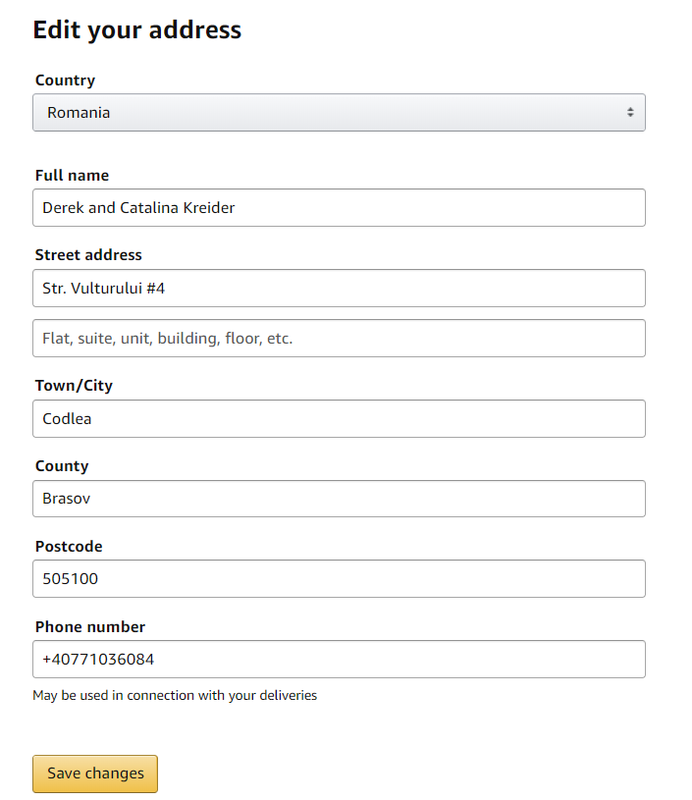 If you want to do this, here's how to find out what can and cannot be shipped to us in Romania. When you go to Amazon.de be sure to temporarily change your preferred shipping address with the following address information. If you do this, then all of the products you look at will tell you if it CANNOT be shipped to us.